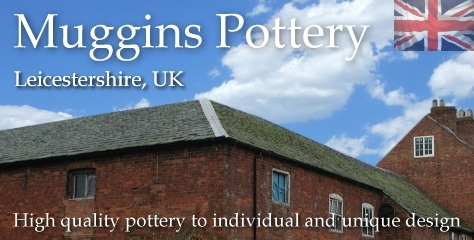 Pottery Cats | hand-made pottery from Muggins Pottery in Leicestershire - wedding gifts, birthday presents, christening presents and anniversary gifts. Classic Muggins hand-made leggy cat. This one is sitting down and relaxing, something cats do best. Size is between the miniature cats and the cat money boxes. Classic Muggins hand-made leggy cat. This one is standing, but getting ready to sit down and relax. Size is between the miniature cats and the cat money boxes. A large cool cat with a serious attitude (and sharp claws). Hand-made and completely original. Put him on your shelf and he'll guard the silver. This one is seated. Also included is a tiny mouse with a chunk of cheese. A large cool cat with a serious attitude (and sharp claws). Hand-made and completely original. This one is crouching. Also included is a tiny mouse with a chunk of cheese. For the kids in your life - encourage them to keep the pearlies clean with a Muggins Cat Toothbrush Holder. Classic Muggins hand-made leggy cat made for sitting on a shelf or bookcase. This one is lying down and relaxing but keeps an eye on what's happening below. Size is between the miniature cats and the cat money boxes. Tail can be up or down. Height is measured from ears to front toes. Classic Muggins hand-made cat (somewhat well fed) made for sitting on paper and other things that tend to vanish in the wind. Size is between the miniature cats and the cat money boxes. Each one hand-made and completely unique. Face tends to look upwards rather than across, so it's also suitable for low-level places such as the fire hearth, ie near where the real cats usually hang out. Thank-you very much for your prompt attention to my order. The box I ordered arrived first thing this morning (Saturday). I am absolutely delighted with my choice. I will certainly think of you again should I need another distinctive gift.